Following on from the unprecedented success of 2010’s Alice in Wonderland live action sequel-of-sorts, it was unsurprising to see Disney mine their seemingly endless supply of franchise in the hopes of re-igniting that particular spark of success with the world of Oz. Whilst that may be a cynical perspective to approach Oz the Great and Powerful with, the similarities and overall tone and feel of the two movies are markedly similar just from first glance, even with a different (and equally distinctive) director on board. Fortunately, whereas Alice was something of an incoherent and poorly realised mess lost under a sea of questionable CGI, Oz the Great and Powerful is a much more confident and inventive affair which ends up being a perfectly serviceable prequel to the events of the beloved MGM classic. The film follows the story of ambitious circus magician Oscar Diggs or ‘Oz’ (James Franco) who, striving for ‘greatness’ and to become the next Houdini (or Thomas Edison) in between bouts of womanising, finds himself swept away into the world of Oz courtesy of those frustratingly commonplace Kansas tornadoes. As the aspect ratio widens, the black and white segues into glorious technicolor and Oz realises he certainly isn’t in Kansas anymore, it becomes clear quickly that this is a film seeking to both honour and pay homage to the original movie whilst doing a fresh and fun job of crafting characters and an origin story with their own arc and pathos. 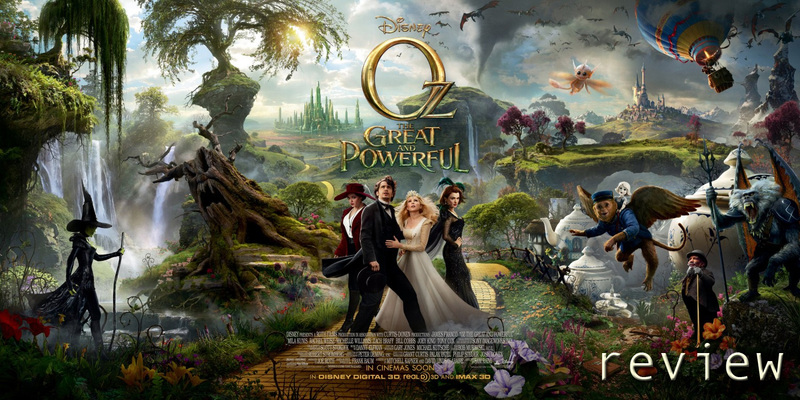 As the film progresses, Oz finds himself embroiled in the politics of the Emerald City, a pair of sister witches (Rachel Weisz and Mila Kunis) who may or may not have affiliations with an unseen ‘Wicked Witch’ currently causing mayhem in Oz, and the attempts of Glinda the Good (Michelle Williams) to set everything right. What’s most refreshing about the tale being told here is that director Sam Raimi and his writers are able to use our preconceptions of the story as a means of some fun misdirection; the entire plotline surrounding the ‘Wicked Witch’ character, for instance, is not as streamlined and straightforward as the audience is initially led to presume, and whilst many of the developments and plot twists the film introduces are relatively predictable and unsurprising, it adds to the fun and whimsy of the film that it continually injects some key plot and character curveballs. There are plenty of knowing nudges and winks throughout, including obligatory appearances from the likes of munchkins, Glinda’s bubbles, dangerous poppy fields and repeat visits to the Emerald City itself, though for all of the familiar, Oz does a generally successful job of expanding the world and introducing new characters and elements to the experience. The character of Finley, a flying monkey bellhop voiced by Zach Braff initially irks as the wisecracking animal sidekick archetype, but over the course of the film becomes far more tolerable and endearing. A brilliantly realised and beautifully animated China Girl character is one of the films real triumphs, both technically and in terms of an imaginative, believable character weaved into the films narrative and perfectly fitting into the whimsical world of Oz. Some of the characters fall flat, most notably the smaller comedy supporting turns, such as Tony Cox’s upstart City Herald Knuck, whose street-talking and sass-backing rarely evoked laughs and generally felt at odds with the world around him, but generally the core cast of characters are a well-realised and enjoyable bunch to spend time with. The central cast are something of a mixed bag. The script gives Oz himself a fitting and nicely charted journey from self-serving egotist to unlikely saviour (and friend) but at times the usually charming Franco struggles to convey anything other than dour awkwardness. There’s the occasional tender reprise, but generally his performance is somewhat forced and wooden throughout, and at key moments such as speeches intended to impress or inspire, or the bombastic, scenery-chewing finale he comes across more hammy or cringe-inducing than wonderful. Fortunately the triumvirate of witches fare far better, and whilst to discuss any of the three characters in any detail would spoil significant portions of the plot and film, the latter half of the film in particular is dominated by the trio, and thankfully so. Weisz and Williams are fitting antitheses as Evanora and Glinda, but it is Mila Kunis who truly comes to dominate the film with her sultry yet commanding performance as Theodora. Although the character’s journey and arc is initially a little rushed and almost schizophrenic in extremities, Kunis outshines practically the entire cast when she eventually dons some heavy Oz history and responsibility, and gives a fiery, scene-stealing performance that is simply a wonderful, wicked delight to watch. The film itself is generally visually arresting throughout, though more often thanks to the wonderful art direction and some vibrant, kinetic direction by Raimi than the effects work. Aided by some genuinely impressive and inventive use of 3D (both eye-popping and atmospheric), some of the key sequences are genuinely sumptuous and a treat for the senses almost on par with Ang Lee’s terrific work in Life of Pi. However, at times the film does fall prey to the same over-abundance of ropey CG that plagued Alice in Wonderland, and it is here that the illusion of Oz and the story being told begins to register as false and the film feels a little cheaper and incoherent as a result. Oz the Great and Powerful was never going to hit the same heights as the 1939 classic, nor was it ever fair to expect or presume it to do so. It is a film decidedly of it’s era, and whilst it is quite the spectacle, the ubiquitous nature of the effects work means it will likely become dated and overlooked relatively quickly. It is, however, a relatively faithful and entertaining adventure romp and mostly a visual delight that that will likely please an audience of all ages, doing a satisfying job of establishing the foundations of the original Wizard of Oz story in an empathetic and engaging manner. Lending extra backstory and reasoning behind the Wizard’s deceit to Dorothy and friends might ultimately split an audience, but there is no harm, and in fact plenty of fun to be had, from seeing how the man behind the curtain put himself there. Press access for this screening of Oz the Great and Powerful was provided by Walt Disney Motion Picture Studios UK directly. (A)musings Media gratefully acknowledges their generous invitation. So excited to see this and I really enjoyed alice in wonderland so I think Im going to end up loving oz! Does it include any of the characters from return to oz as disney made that as well?